Enjoy Holi by making beautiful Holi rangoli design in your home. Holi is one of the major spring festivals of India. It is a festival of colors, joy and happiness. It brings people together, creates harmony and bonds them with love. Holi celebrations start on the night before Holi with a Holika dahan. People gather, sing and dance around the bonfire. The next morning people play with color. They chase each other carrying water guns, dry colored powder and colored water-filled balloons. Nobody is spared on Holi, everyone has to play. People visit family, friends and foes and throw color on each other. They laugh, enjoy and have fun. Holi delicacies are prepared at every house. Colorful rangoli designs for Holi are made and in the evening, people dress up and visit friends and family. Wish everyone “Happy Holi” with this nice Holi rangoli design. I love this creative rangoli, specially the smiley. Make this beautiful, colorful birdie. 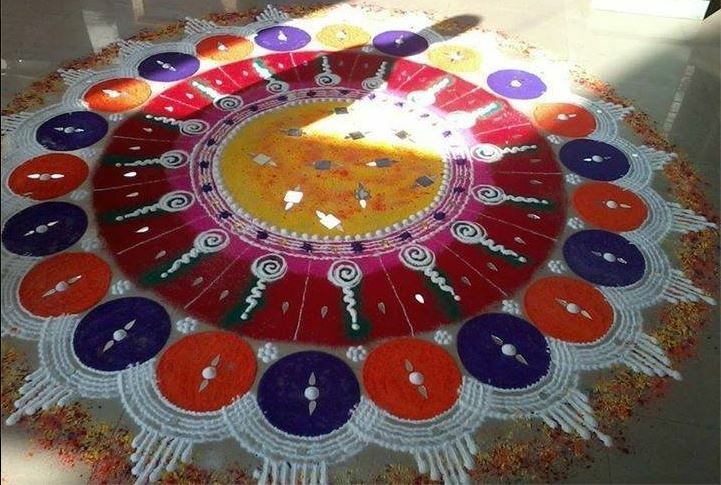 It is is a very easy rangoli design and can be made by kids and beginners. 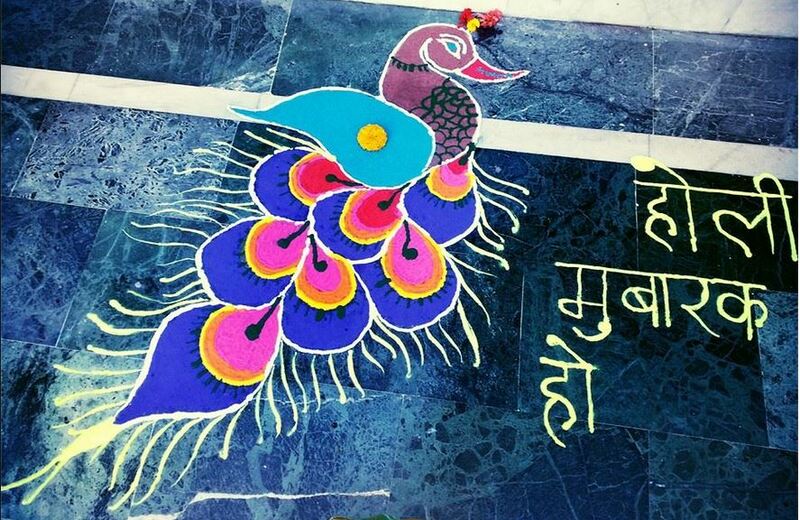 Draw a peacock rangoli for Holi. 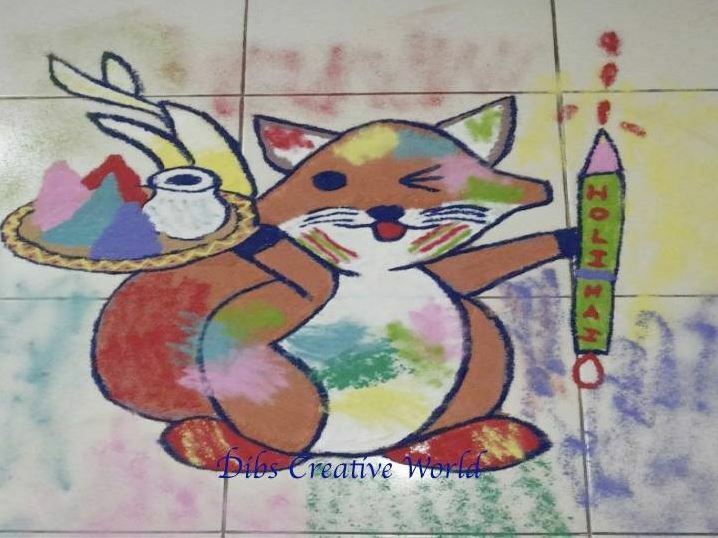 Make this Holi ki rangoli at the entrance of your house or in your living room. 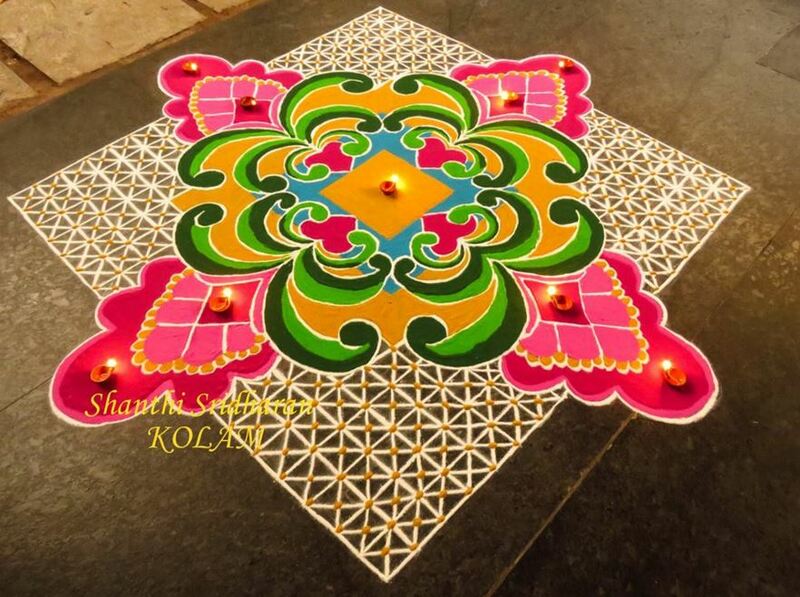 Go for this pretty kolam rangoli design for Holi. 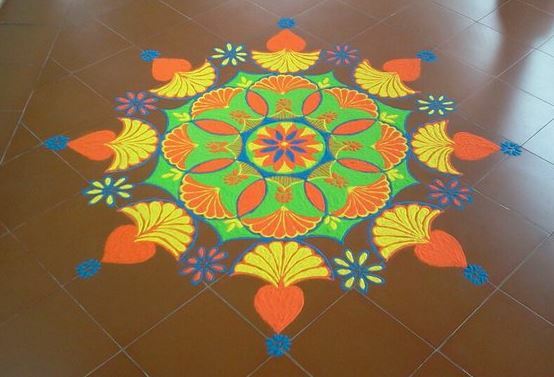 Use a lot of different colors to create this kolam design. Add a bit of spice to your Holi celebration. 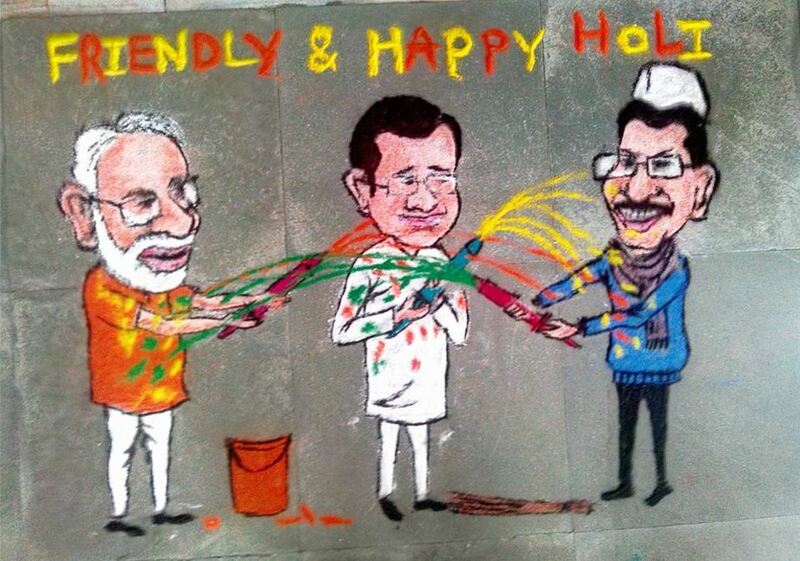 Make this politically inspired rangoli design of Narendra Modi, Rahul Gandhi and Arvind Kejriwal playing Holi together. 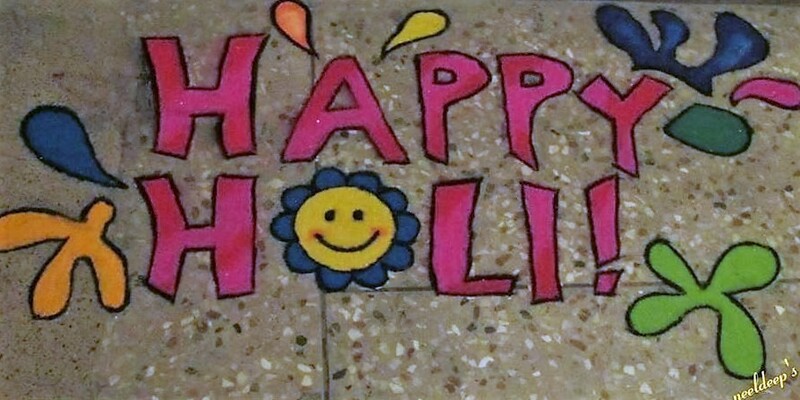 Check out this rangoli design with Holi theme. 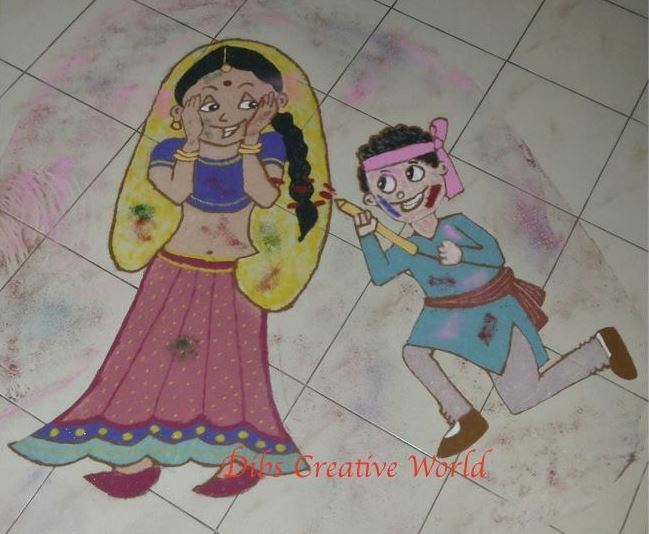 There is the element of mischief in this rangoli that reflects the very essence of Holi. On Holi we play with water color and gulaal (powder color). Make this cool Holi rangoli design on festive eve. Here is a colorful kolam for Holi. 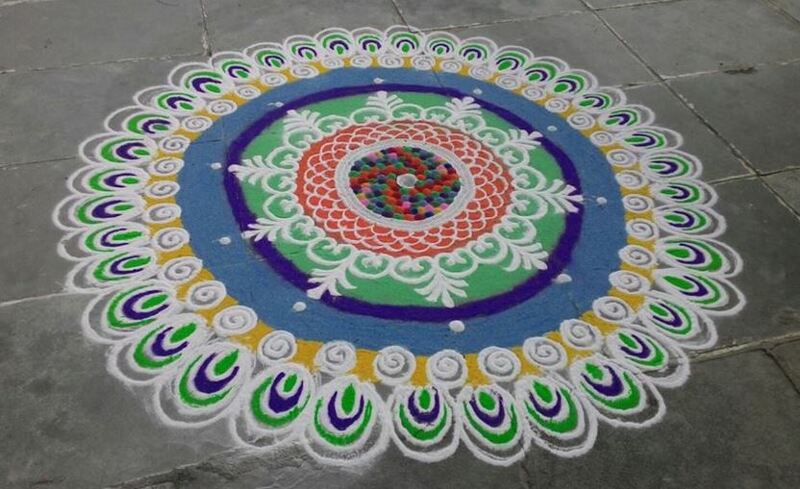 Make a simple round kolam design and fill it with bright rangoli powder. 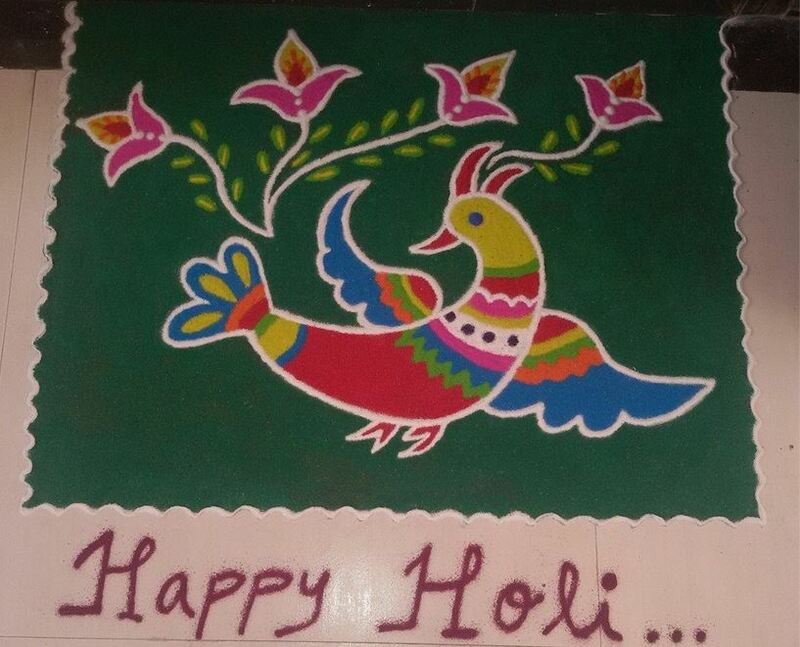 The use of red in the centre and green on the outside makes this Holi rangoli design very attractive. Here is another amazing rangoli for Holi. 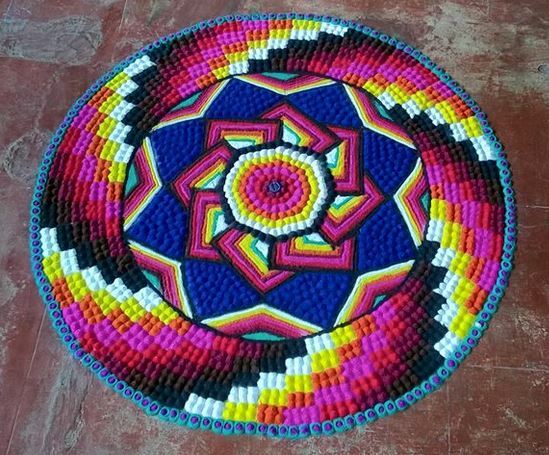 Use colored rice or salt to make the centre and make a nice border around it. Choose this rangoli for Holi. You can place a flower pot in the centre. 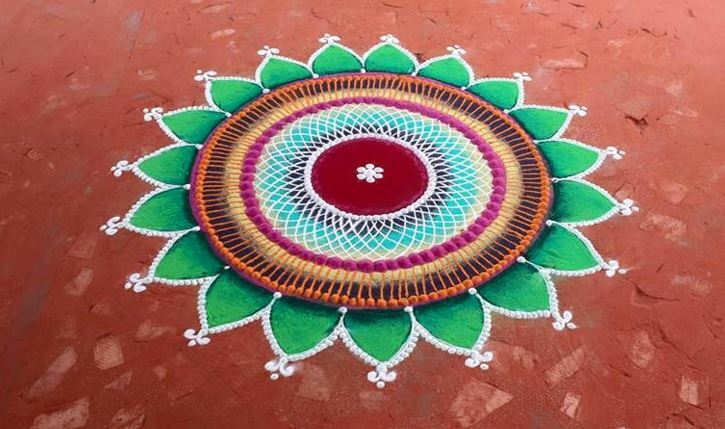 Use white, yellow, green, red and brown to make this rangoli. A perfect rangoli for Holi! I love the splash of colors in here. Go for this awesome Ganpati rangoli design for this year Holi. 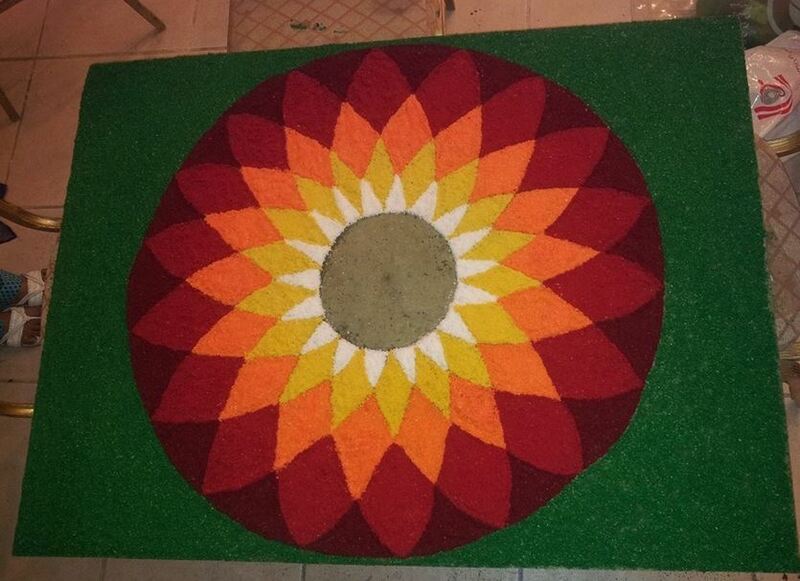 Check out this hexagonal Holi rangoli with a circular design in it. Fill each circle with a different color. 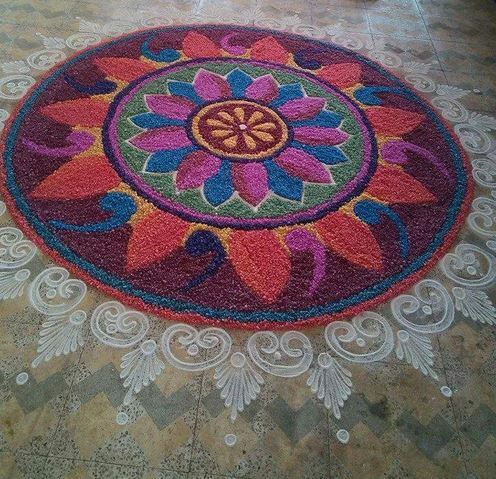 Give an elevated look to your rangoli. Use dots to create this stunning, multi-colored Holi rangoli design. 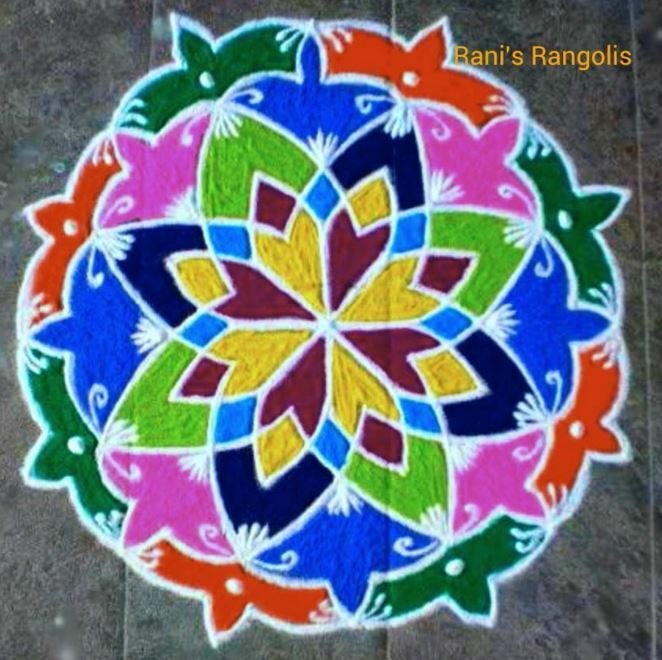 Make this simple Holi rangoli by drawing colorful concentric circles. Then, use white rangoli powder to make patterns on them. 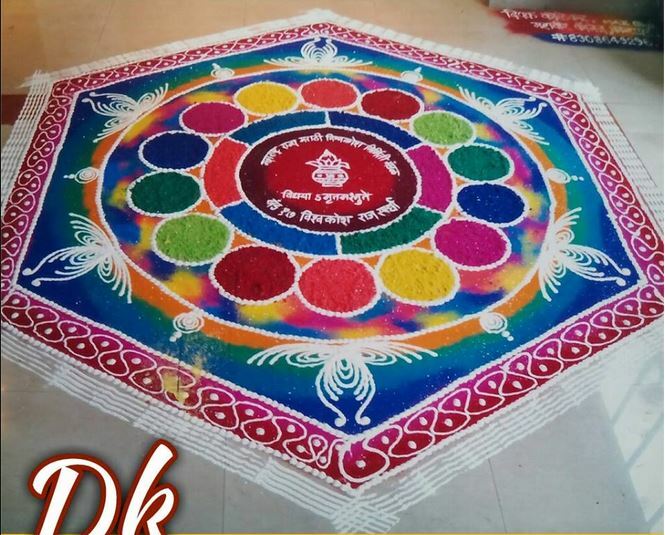 Use Sanskar Bharti patterns to prepare this awe-inspiring rangoli. The border is inspired by peacock’s feather. Make this 3D rangoli for Holi festival. The design is pretty illutional in nature; stare at them and they seem to move. 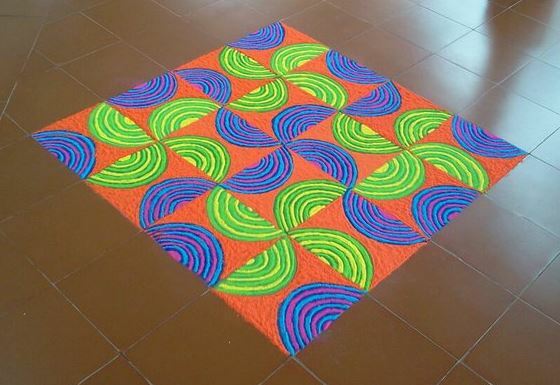 You can even make this free hand kolam rangoli design for Holi. Make cute floral patterns to get this look. Use shells, cut mirror and sequins to pep-up your rangoli. Make this amazing rangoli on Holi. 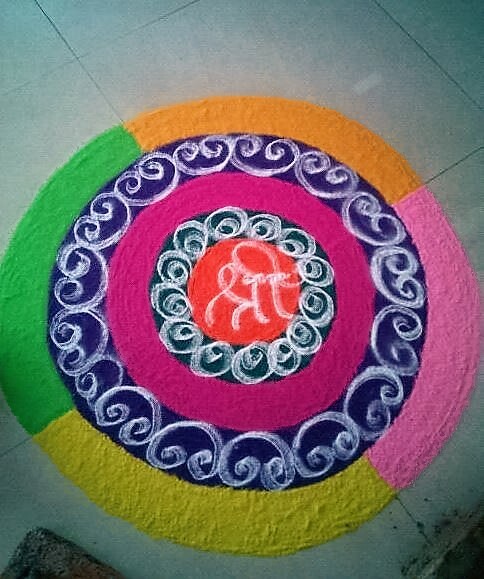 This entry was posted in Decor, Rangoli Designs and tagged Award Winning Rangoli Pictures, Beautiful Rangoli Designs for Competition, Festival Rangoli Designs, Festival Rangoli Kolam, Holi Festival Rangoli, Holi Ki Rangoli, Holi Rangoli, Holi Rangoli 2016, Holi Rangoli Design, Holi Rangoli Design Images, Holi Rangoli Designs, Holi Rangoli Photos, Holi Rangoli Pictures, Holi Special Rangoli, Holi Special Rangoli Design, Rangoli, Rangoli Design, Rangoli Designs, Rangoli Designs Color, Rangoli Designs for Competition, Rangoli Designs for Holi, Rangoli Designs for Holi Festival, Rangoli Designs for Kids, Rangoli Designs with Theme for Competition, Rangoli Patterns, Rangoli Patterns for Holi, Rangoli Pictures, Simple Holi Rangoli Designs, Simple Round Rangoli by Homemakeover. Bookmark the permalink.